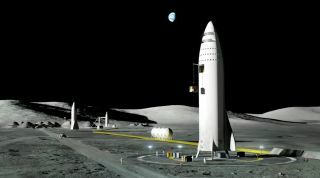 Artist’s illustration of SpaceX BFR spaceships on the moon. "If we can do that, then all the resources that are used for Falcon 9, Heavy and Dragon can be applied to this system," Musk said at the 68th International Astronautical Congress (IAC) in Adelaide, Australia, where he unveiled SpaceX's latest Mars-colonization architecture. "That's really fundamental." The newly announced BFR system is a bit scaled-back compared with the ITS concept that Musk unveiled last year; the rocket will feature 31 Raptor engines rather than 42, for example. But the most important change in the architecture involves the eventual phaseout of the Falcon 9, Falcon Heavy and Dragon, the billionaire entrepreneur said.